The session of the Council of Heads of Member States (CHS) will be held against the backdrop of the uneasy situation in the world. The establishment of a new polycentric model of the world order is accompanied by the intensification of global competition, which is frequently unfair and aggressive, rivalry in the area of value landmarks and development models. This does not contribute to the effectiveness of the efforts to confront the threats, which are common for everybody: terrorism, illegal drug turnover, trans-border crime, the search for collective answers to the growing challenges of food security, energy and environmental security. The growing aspiration of the people to determine their fate themselves, to preserve their civilisational and cultural identity, frequently faces the attempts of some powers to dominate on the international stage, to interfere in domestic affairs of other states ignoring the norms of international law and sometimes even simple decency. Such attempts lead to the degradation of the situation, increasing chaos and anarchy. Libya, Iraq, Syria, the deep crisis of national identity in Ukraine are in front of our eyes. We are convinced that we need to search for global and regional problems by political and diplomatic methods through cooperation and the search of compromises, on the firm ground of international law and preserving the leading role of the UN. When we are all acting together on common ground, we can achieve positive results: the negotiation process on Iran’s Nuclear Programme is ongoing quite successfully, the elimination of the chemical weapons removed from Syria has almost ended. The SCO consistently speaks in favour of approving principles of equality, mutual respect and consideration of each other’s interests, which have always determined the nature of our work within our Organisation. The agenda today includes a further combination of our efforts in the interests of effectively responding to the events taking place in the world and in the region. I primarily mean the situation in Afghanistan taking into consideration the “2014 factor”. We welcome the conduct of presidential elections in this country; however, their results are still not clear. There are still risks that the situation will deteriorate after the removal of foreign troops from Afghanistan and the flow of instability to the Central Asia region. In this regard, we propose to adopt additional measures to ensure security of our countries, to use the possibilities of the Regional Anti-Terrorist Structure (RATS) as much as possible and to transform it into a universal centre for fighting new challenges and threats. We propose to grant RATS new anti-drug functions as the first step. We could start from creating a work group to counteract funding of terrorism at the expense of drug business. The framework agreement on border issues could become essential in fighting the penetration of terrorists and religious extremists into Central Asian countries. The preparation of this document for signature at the summit in Dushanbe would correspond to our joint interests. We deem it appropriate to focus the discussion between the heads of state in a “narrow format” on SCO tasks to ensure regional security in the context of the Afghan situation. We believe that the SCO is an optimum arena for the political dialogue on Afghanistan without any involvement into military aspects. A solid package of documents has been prepared for the CHS session, and the heads of state will have to review them. 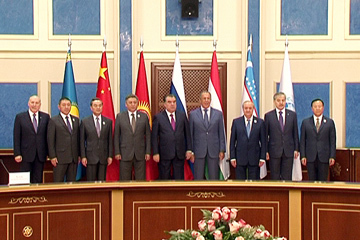 The draft Dushanbe declaration looks balanced and full of content. Of course, we have to update individual provisions taking into consideration the dynamically changing situation. In particular, Russia will propose to add supplements to support the stop of bloodshed and start of a nation-wide dialogue in Ukraine as soon as possible, as well as about the preparation of a joint statement by the SCO and the ASEAN on anti-drug problems. The approval of a new version of the model memorandum on the obligations of countries applying for membership in the SCO and the Procedure of granting membership to the SCO will become an important step. This is a serious landmark, which will be followed by a substantial discussion of the issues of extension of the Organisation. Candidates are already known. The very logic of developments in the world and in the region dictates that it is appropriate to reinforce the SCO based on the principles defined by its founding states. We devote a lot of attention to the preparation of the SCO Development Strategy by 2025. To implement the order by the CHS in Bishkek, Russia has transferred a respective draft for review to its partners. We expect that the approach to this work will be constructive and hope that it will be adopted at the summit next year, which we propose to hold on the 9-10 July in Ufa. We asked these deadlines be confirmed soon. The tasks of development of economic cooperation, including the coordination of supplements to the list of events on further development of project activities within the framework of the SCO for 2012-2016, will be reviewed in August during the meeting between representatives of the economic agencies. The launch of the Energy Club with participation of SCO member-states, observers and dialogue partners can be added to our successes. The Energy Club is an open and prospective arena for the discussion of issues of energy security, the set-up of contacts between those who generate, transit and consume energy resources. The holding of the panel session “SCO – space for economic and business interaction” within the framework of the St. Petersburg International Economic Forum this May was valuable. We hope that representatives from countries of the Organisation will active participate in the SCO’s Second Youth Forum on business and cross-border cooperation in August in Belokurikha, Altai Territory. At the same time, we have some “hanging” issues which should be resolved. First of all, I mean the draft agreement on the creation of favourable conditions for international transportation by road. Every time we postpone its signature, because we receive propositions on new routes. We should aim to get out of this vicious cycle and attempt to sign this document in Dushanbe. The creation of mechanisms for the financial accompaniment of Organisation’s project activities is needed. Our financial specialists believe that the establishment of the SCO Development Bank on the basis of the Eurasian Development Bank, which is successfully operating in the region, will be the most efficient way of doing this. Now we are discussing this option with all the colleagues. A lot of things have been done in the area of humanitarian cooperation in the past year. The seventh Week of Education devoted to the issues of preparation of teaching staff for education institutions of SCO member states (May, Ufa), and the International Festival Student Spring of SCO Countries (July, Chita) were held successfully. Next year we will celebrate 70th anniversary of the Victory in the Second World War. The heads of our states will make a special decision on this issue. Russia devotes special attention to the preparation to the forthcoming anniversary. The Organising Committee is headed by the President Vladimir Putin. We know that ceremonial events will be held in your countries as well. We propose to instruct the SCO Secretariat to provide organisational assistance to ensure participation of delegations from all the member states in these events. The development of interaction with observers and dialogue partners also contributes to the strengthening of our authority. Russia is always in favour of their active involvement in the practical aspects of work of this Organisation. We are grateful for the support for our proposition to invite observers to the next meeting of secretaries of security councils of SCO member states. I think that we should support their participation in the work of the RATS, including in areas such as the exchange of information and staff preparation, the contribution to the implementation of the SCO’s Anti-drug strategy, as well as the involvement in joint counter-terrorism exercises. We value highly the results of the first meeting between national coordinators of member states and representatives of observers in 6+5 format in April in Beijing. We think that we need to continue this valuable practice. SCO priorities include the deepening of ties with other international organisations. We have good opportunities for that – memorandums of interaction with the CSTO, CIS, ASEAN, and more recently the CICA was signed. Now we need to fill this cooperation with specific content. We believe that the registration of ties with the Eurasian Economic Union would also benefit everyone. The build-up of interaction with the UN has a special meaning, including in the context of our efforts on Afghanistan. We believe that in this arena SCO countries should try to reach a higher level of coordination of positions and mutual support. I also would like to draw your attention that this year the UN Secretary-General plans to issue a report on cooperation between the UN and the SCO, and interested participation of all the members of our organisation is demanded. I am convinced, by joint efforts, we will be able to ensure successful conduct of the summit in Dushanbe, which will be a decent end for the Tajik presidency. We expect for your active support in the period of presidency of the Russian Federation in the SCO. 544: 30 seconds to mars. Speech by the Russian Foreign Minister, Sergey Lavrov, at the SCO CFM session, Dushanbe, 31 July 201431 July 2014: Speech by the Russian Foreign Minister, Sergey Lavrov, at the SCO CFM session, Dushanbe, 31 July 2014! лучшие комедии. Speech by the Russian Foreign Minister, Sergey Lavrov, at the SCO CFM session, Dushanbe, 31 July 2014.